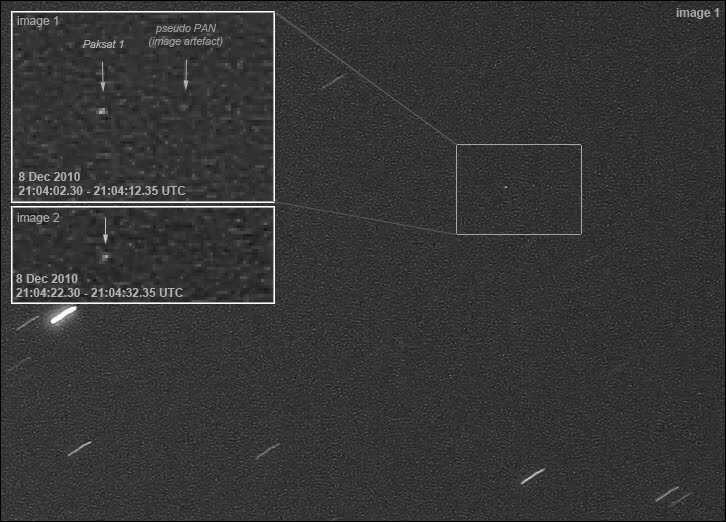 SatTrackCam Leiden (b)log: Mystery satellite "UNKNOWN 101208" is PAN! Those of you following this observing blog and the Satobs list, will be aware of the observations of the past week of what appeared to be an unknown geostationary satellite. It was first observed on December 8th by me, and next by Greg Roberts as well (see here for the discovery, as well as here, and here for the follow-up). It was first thought to be perhaps DSCS 3-11, but that turned out to be incorrect. So it was a bit of a mystery, as no recent launch was a candidate either. And geosats just don't "materialize" in the sky. Obviously, this was an older geosat being relocated: but which one?! The mystery has now been solved, by Greg Roberts. The satellite is PAN (2009-047A), relocating to a position more to the east. 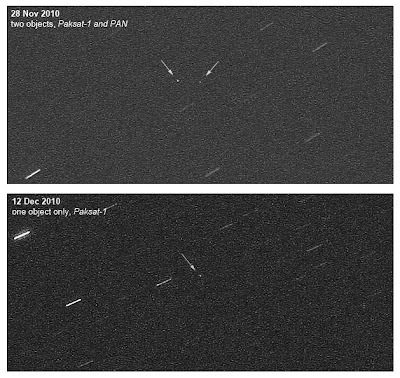 Greg imaged the old position of PAN (close to Paksat 1) on the 12th, but couldn't detect it. So he made the obvious conclusion: PAN was gone and identical to the eastwards drifting satellite we called "Unknown 101208" since December 8th. I can actually confirm Greg's result of the 12th: I imaged the "old" position as well that same evening and like Greg find no trace of PAN, only Paksat 1 is present. So how about my "observation" of PAN near the "old" position on December 8th, the same evening that I first spotted "Unknown 101208"?!? It is very embarasing, but I turn out te have been fooled by an image artefact! With hindsight, I should have been suspicious: the little dot I thought was PAN was quite faint, and visible on only one out of 2 images. This unlike my November 28th observations, when the true PAN clearly showed up in its "old" position on multiple images. 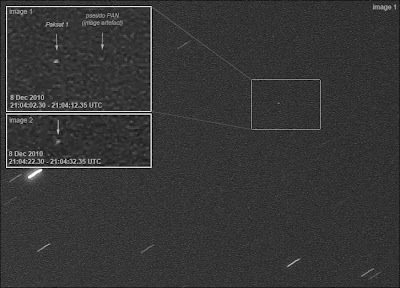 Below image shows the image artefact that fooled me on the 8th (the insets show details of this image, and a second image taken 20 seconds later on the same evening which only shows Paksat 1 - which with hindsight should have warned me). Here is another image, showing PAN and Paksat 1 on November 28, and Paksat 1 with PAN no longer present on December 12th. With the current drift rate of just under 0.5 deg/day, PAN probably started to relocate on or around December 1st.